In 2011, after graduating from university in Urumqi, Memeti Aili went to study in Turkey like many other Muslim Uyghur students. Soon after settling down in Istanbul, someone from the ETESA approached and offered him "help." Together with other young people, Memeti Aili travelled to Aleppo, the largest city located in northwestern Syria and arranged to join the rebels. The percentage of foreign fighters in Syria has reached up to 80 percent from 29 countries such as Libya, Turkey, Lebanon and Yemen, according to Omran Zoubi, Minister of Information in the Assad government. Before arriving in Syria, Memeti Aili said he had never touched a gun. Together these young people received seven days of training in the suburbs of Aleppo where there was no water or electricity supply, and food was scarce. "We had to change sites four times a day in fear of possible bombings from the Syrian army, therefore we didn't learn that much during that week," he recalled. During the training, he was shown how to shoot a gun and make bombs. But not all of them had the chance to practice and many just watched and hoped that something would sink in. After this rushed training, Memeti Aili was assigned to join the Free Syrian Army (FSA), an armed opposition structure operating in Syria. "We were running around Aleppo like madmen to avoid possible bombings and air attacks," said Memeti Aili, "We didn't see the Syrian army, but we saw the places where our guys got hit by bombs and died." He helped to take the wounded to the local hospitals, but they were told only one hospital was still working and was frequently bombed. His comrades were left to die. What surprised Memeti Aili the most was that foreign fighters were not really welcomed by locals. "We thought that if we brought holy war into Syria we would be welcomed, but the fact is, we were told by the local people that we were not welcome as they didn't want their lifestyle to change," Memeti Aili said. Most of the inexperienced fighters were killed due to inappropriate gear. Luckily for him, Memeti Aili was assigned to nighttime patrols instead of fighting in the front lines. Two months later he was sent back to Istanbul. In a statement released on the groups's official website in 2012, the ETESA denied that any Uyghurs had traveled to Syria to join in the fighting and stated it was not associated with any terrorist organization. "The Uyghurs have never participated in any terrorist activities or have never carried out any violent actions against anyone or any government," it said. Speaking in the wake of terror attacks on April 23 in Xinjiang's Bachu town that killed 21 people, Meng Hongwei, vice minister of public security, said the fight was being influenced from overseas. He stated that East Turkistan "secessionist terrorists" had been intervening as the police had cracked down on Eastern Turkistan terrorism flags and home-made explosive devices. "As the number of international terror attacks is increasing, we should remain vigilant against infiltrative, subversive and separatist activities by hostile forces at home and abroad," Meng was quoted by Xinhua as saying. Ahmatniyaz Sidiq, an Uyghur man who allegedly has been organizing extremist activities since February, attacked a local government building and police station in Turpan last week together with 15 other people, according to the police. The police said they had been listening to recordings of the men inciting violent terrorist activities, raising money and arranging to buy knives and gasoline earlier in June. 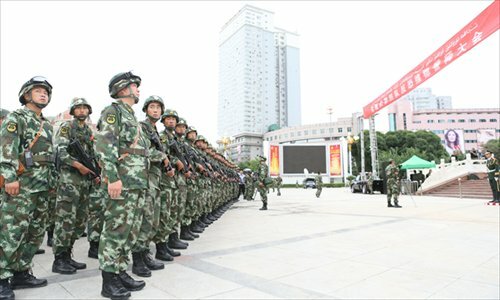 Chinese police have struck a heavy blow against ETIM in recent years, but ETIM still seems able to inspire members about the "three evil forces" of separatism, extremism and terrorism, according to the Ministry of Public Security. Li Wei, an expert on anti-terrorism with the Chinese Institutes of Contemporary International Relations, told the Global Times that the recent terror attacks in Xinjiang showed that "East Turkistan secessionist terrorists had copied the international mode and used it in Xinjiang." "For example, law enforcement personnel have become their main target, and instead of launching suicide attacks, they focus on training and recruiting new members and promoting their values," Li said. Li said the attacks have exposed shortcomings in Xinjiang's counter-terrorism strategy such as placing too many police in big cities and the need for more modern equipment. "We need to strengthen anti-terrorism training among township-level police. They also need to upgrade their equipment and encourage local residents to report suspicious behavior and reward them afterwards," Li continued. Addressing a UN Security Council open debate on comprehensive approach to counter-terrorism in January, Chinese Vice Foreign Minister Cui Tiankai called for the international community to address its root causes. "Such attacks are grave threats not only to China's national security but also to peace and stability in our neighborhood. The international community should fight these groups with unity of purpose and action," Cui was quoted by Xinhua as saying. GT: Did the Syrian army kill or capture any Xinjiang terrorists? IM: Usually we do not publicize the information about those we captured in the media. We inform intelligence agencies in their respective countries. GT: Is there any cooperation between Syria and China in dealing with extremists? IM: We share everything we have with China. We are always willing to share everything that is in China's interests. We have told China many times that if those extremists, who are fighting today in Syria, end up winning, they will go on fighting in somewhere else like Iran. If they win in Iran, they will not stop. They might end up fighting in Russia or in China. This is not only a Syrian struggle. It's a struggle between the forces of secular countries and extreme fundamentalist Islamic ideology. GT: The Chinese authorities have tightened security measures in Xinjiang in the wake of several riots last week. What is Syria's reaction to the current situation? IM: First, we fully support the Chinese government in enforcing law and order throughout the country. Second, we know more than anybody else how dangerous these individuals are. They use the pretext of religion to spread their extremist agenda that belongs in the Middle Ages and not today. Third, we are absolutely confident that China has the strength and expertise to deal with these terrorist groups and we know that more and more Chinese understand the nature of the struggle in Syria against these groups. They are a common enemy to both our nations.